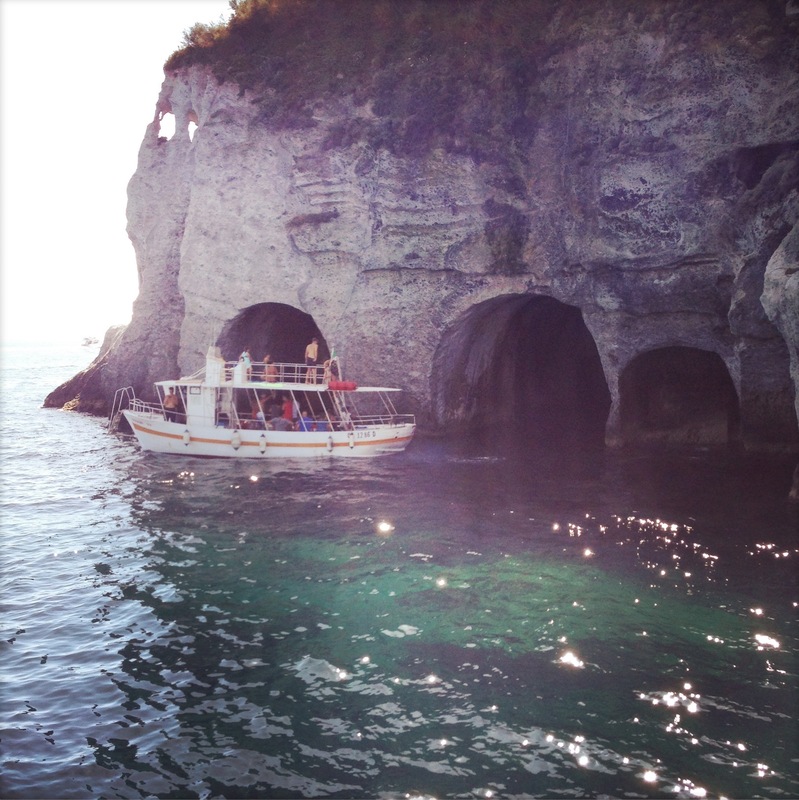 Getting out on a boat and exploring Ponza’s crystalline coves is a must. This was a pleasure, however, that eluded us on our first visit to the island in late September last year. As we noted in our first post on Ponza, the weather was changing already and high winds kept all the boats in port straining at their moorings. This year, we went earlier and the weather gods were with us! 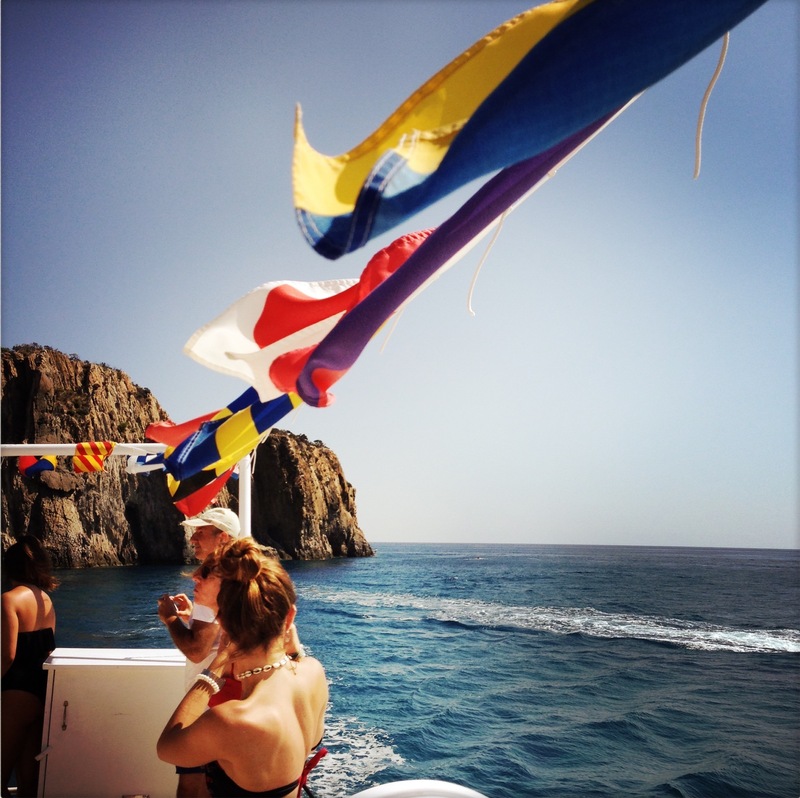 We left for Ponza on Labor Day and the weather was still ideal for boating. 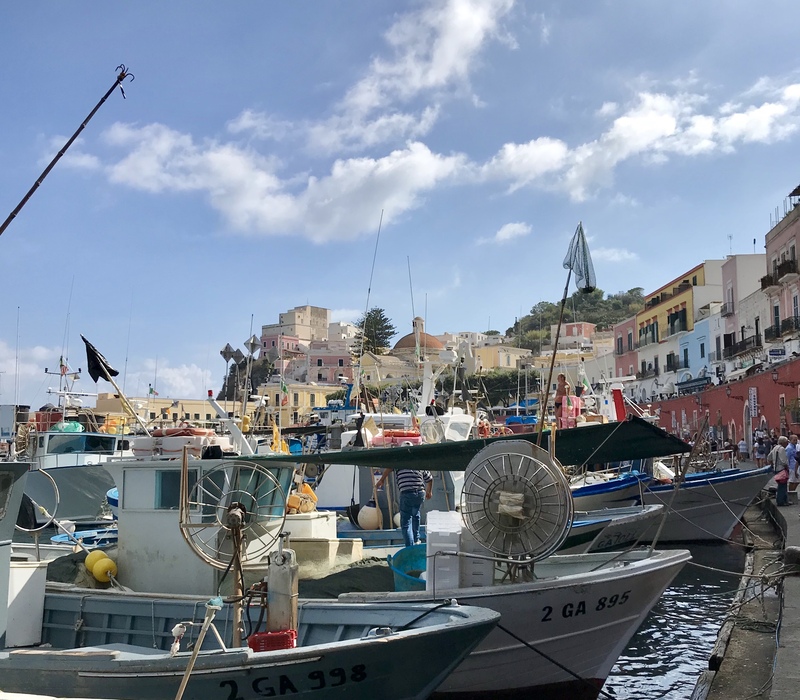 If you haven’t heard about Ponza before, one reason could be that the Romans like to keep it under the radar for their own weekend getaways. In summer the island’s year round population of 3,000 can swell to 30,000 for popular holidays, so visiting in early September is ideal for missing the summer crowds. To get to Ponza, we arrived in Rome early in the morning, took the airport express train to Roma Termini, and caught another train to Formia from there. At Formia, we hopped on the ferry for the two-hour trip and arrived there in the beautiful light of a late afternoon. As the ferry docked, we admired all the colorful, flat-topped houses rising from the port. “Many more boats this time,” Jim noted. A good sign we would make it out on the water on this visit! The next morning we booked in the port a day cruise with the Cooperativa Barcaioli Ponzesi on the boat called the Poseidone for a tour of Ponza and Palmarola. 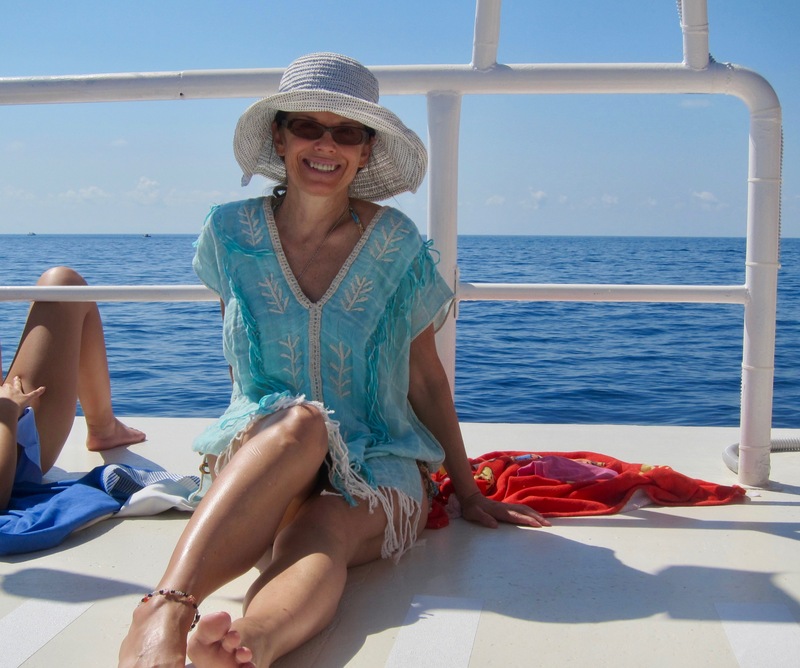 We nabbed a spot on the upper deck, ideal for sunbathing and peering down into the incredibly clear turquoise waters. The Poseidone’s first stop was the Grotte di Pilato, the grottoes owned in ancient times by the family of Pontius Pilate, the Roman governor who tried Jesus of Nazareth. The family’s slaves carved these grottoes out of sheer rock for food storage, to catch seafood, and breed moray eels, a culinary delicacy. We were amazed at how skillfully our captain Vincenzo navigated, edging the boat so close to these ancient wonders. Soon we reached the enticing waters of Palmarola, a sister island of Ponza, dropping anchor for our first swim. We swam into grottoes and marveled at the brilliant color of the water. “Bellissima!” shouted the Italian girls swimming next to us — so many shades of stunningly gorgeous blue. 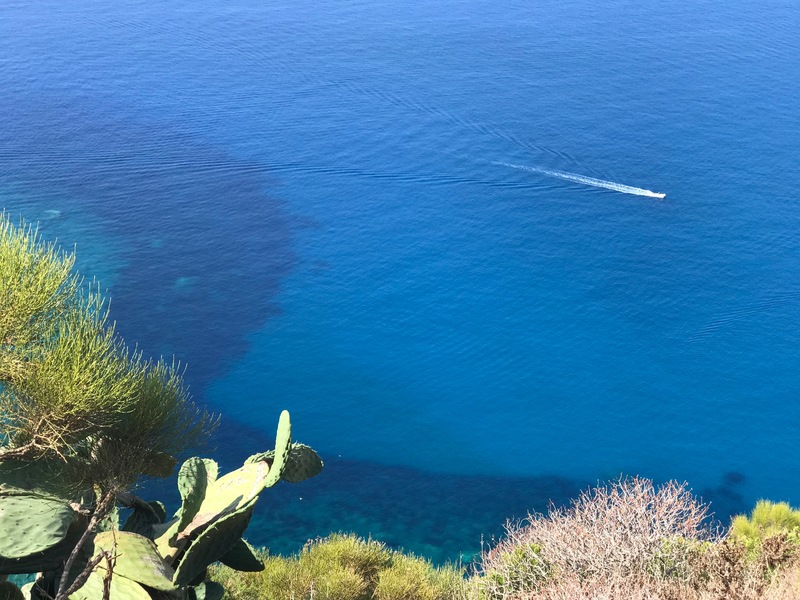 Jacques Costeau and his son, Philippe, filmed several of their ocean documentaries in the waters surrounding Ponza, and the Tyrhennian Sea looks to us as pristine now as then. As we were swimming and snorkeling, the crew was cooking a giant pot of pasta in a tomato sauce with tuna, which they soon served to us with a chilled white wine. As we ate our lunch, we spotted mountain goats on the sheer, chalky cliffs of Palmarola. 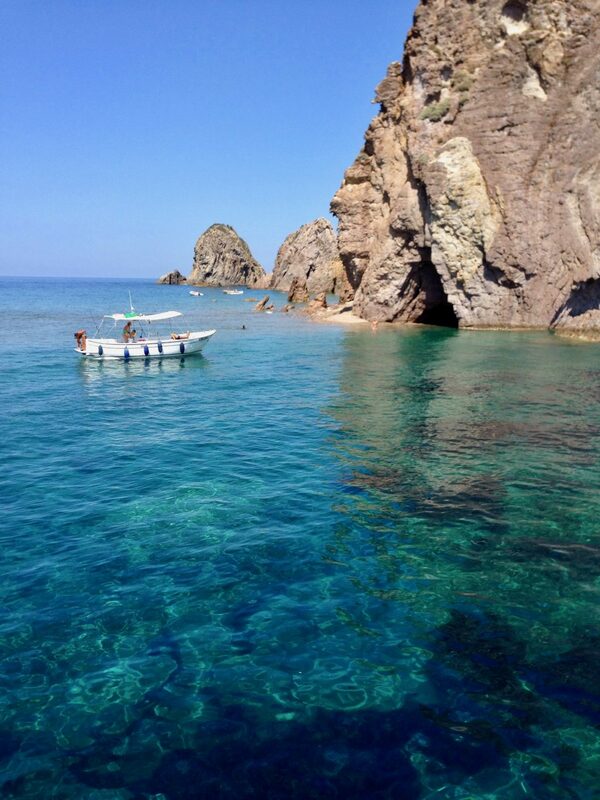 We stopped to swim at several coves around Palmarola, each more beautiful than the last. 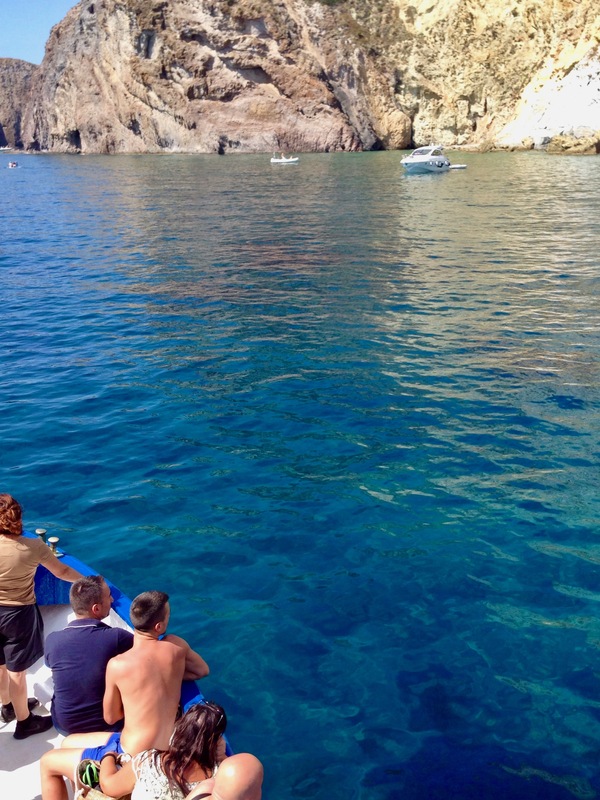 When we cruised back toward port, we circled the back side of Ponza, checking out many small coves or calas, including Piscine Naturali, where swimmers were perched on the rocks. Captain Vincenzo and his able crew showed us their world and gave us a splendid day on the sea. The next day we went high, into the incredible hills over the port of Ponza. The views are amazing, almost as enjoyable to gaze down at the incredible coves as to swim in them. It’s another perspective on this gorgeous island. 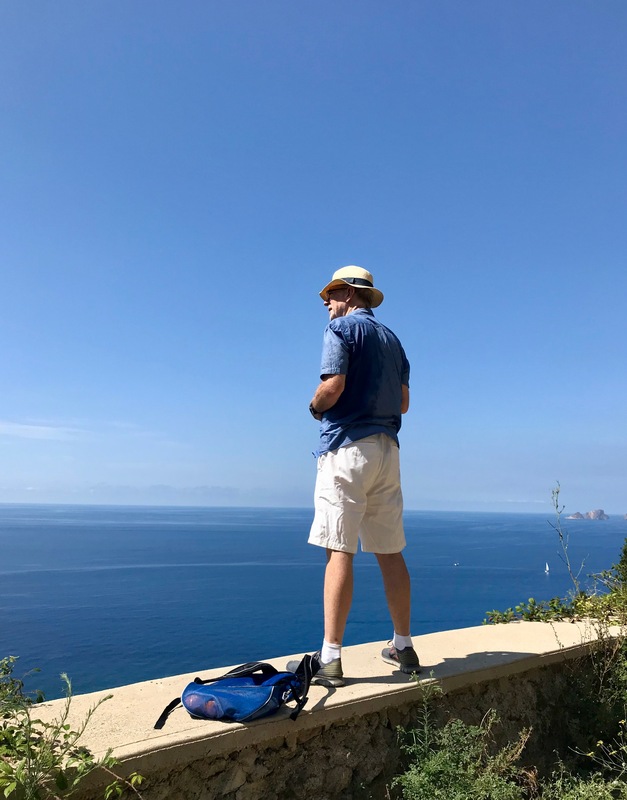 Jim showed me one of the most beautiful island walks he did last year, to the Antiche Cantine Migliaccio, where you climb to terraced vineyards heavy with purple and green grapes overlooking the blue, blue sea. 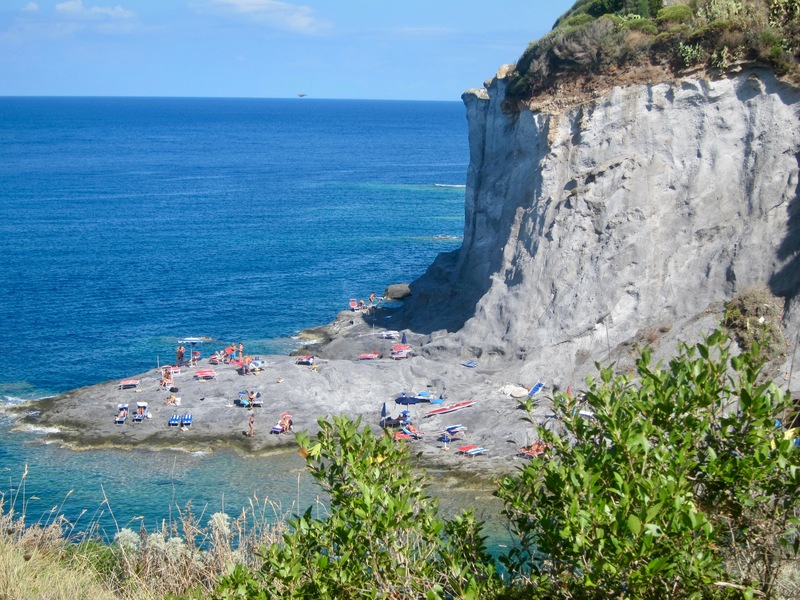 It’s a fairly easy hike, up through narrow streets above the port, to the trail that overlooks the crescent-shaped Chiaia de Luna beach where cliffs drop dramatically into the sea. We passed blackberry bushes, fig trees, and prickly pear cactus. It’s not a long hike, but it is so stunning that you want to stop frequently to drink in the beauty of it all. By early afternoon, we were back from our hike and ready for delicious fresh sandwiches and cold drinks from one of the little groceries along the wharf. 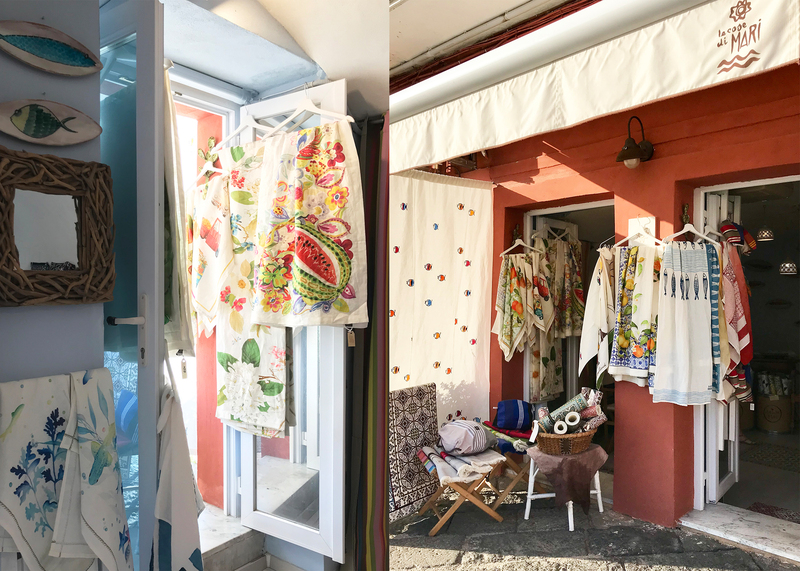 I had plenty of time to shop at some of the lovely boutiques I discovered on our first visit — La Porta del Sole, Cala Corallo, Ceramiche Tirendi, and Le Cose di Mari. 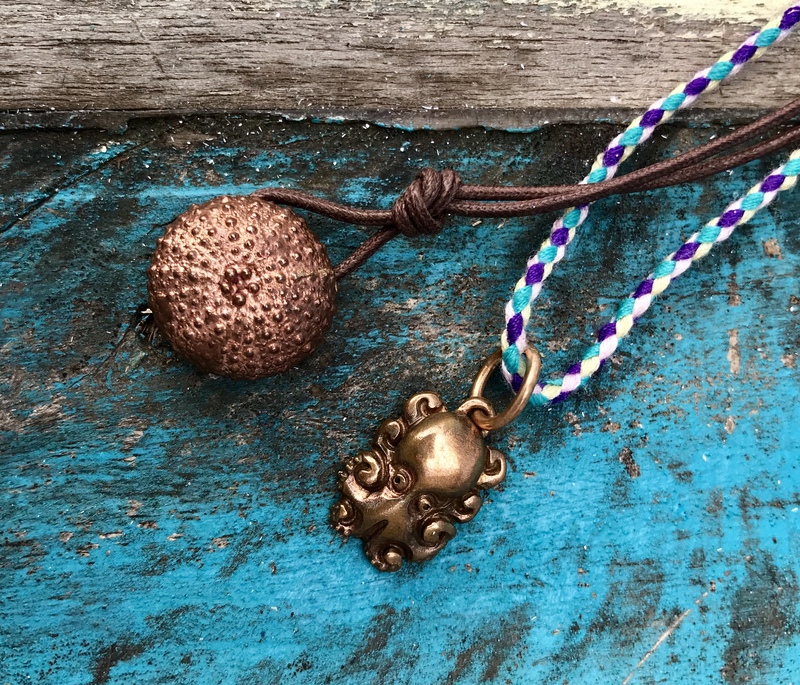 At Cala Corallo, I added a beautiful sea urchin necklace to my collection of jewelry by Alessandra Ravenna. 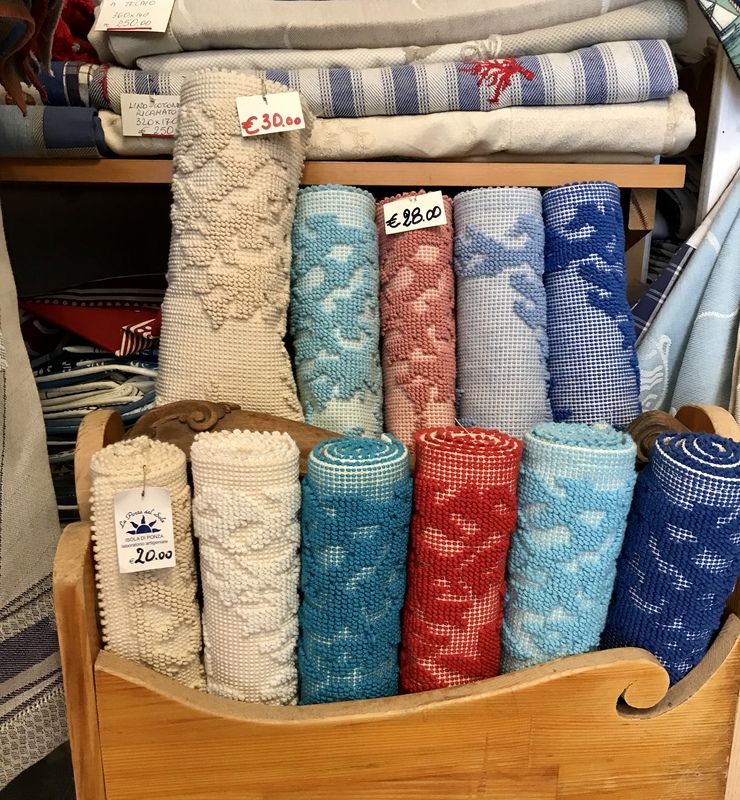 At La Porta del Sole and Le Cose di Mari, beautiful Italian textiles for our home. All of these shops are small. 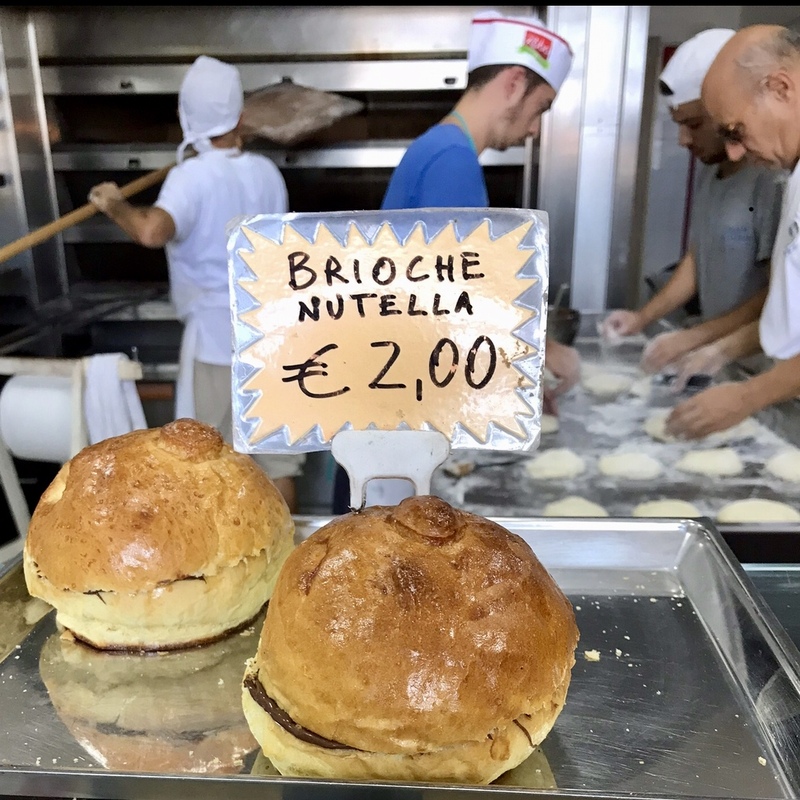 They line the streets surrounding the port, so you can visit them all in not much more than an hour, depending on how long you chat with the charming proprietors. Our third day dawned stormy. 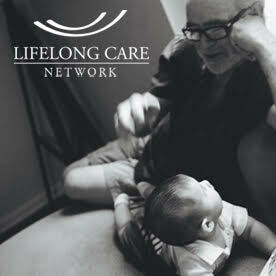 We could hear thunder rolling through the hills above and wondered what our last day would bring. But soon the sun came out, so we caught a bus to the northern part of the island for even more swimming in the clear blue sea. This time we went to the Piscine Naturali, where the “beach” is really formed of huge water-carved boulders. 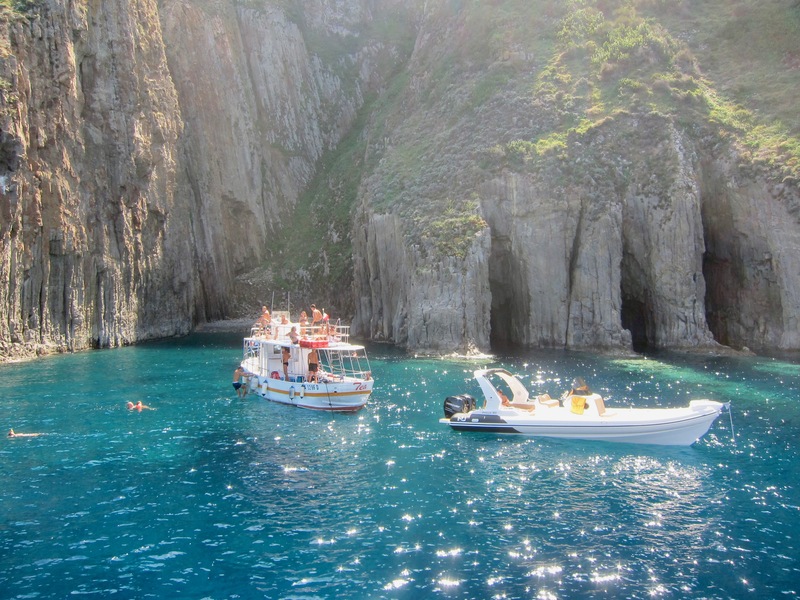 The rocks are sharp, and we were wishing we had brought our water shoes, but it was well worth our efforts for another chance to swim in Ponza’s clear blue waters. For ten euros, you can rent a ‘lettino’ or deck chair with a sun shade and spend the day relaxing in between swims. Best trip ever, I thought to myself as we left Ponza for our next days in Rome. An island getaway on lovely Ponza and a stay in Roma, one of our favorite cities: What an ideal late summer holiday! Stay — the Villa Marisa: https://www.airbnb.com/rooms/6030229?location=villa%20marisa%20ponza&s=2_Vr6pAW — a super convenient studio just steps from the ferry. 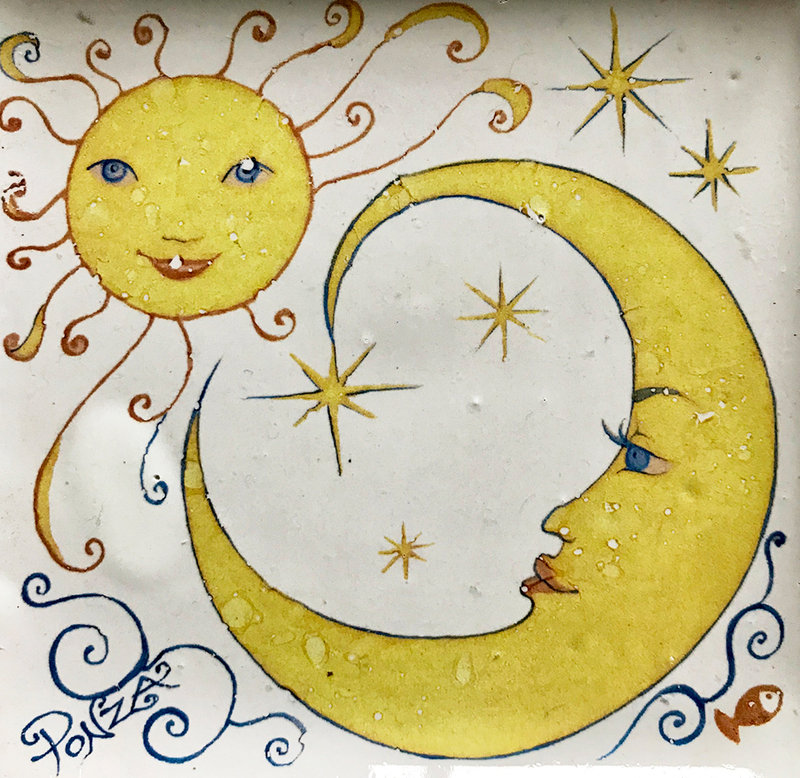 Pizzeria Rosticceria Ponzese —Corso Pisacane — Excellent pizzas (one favorite is the Pizza Joe, a white pizza with escarole) and a 10 euro bottle of Falanghina wine, make for a very satisfying and well-priced meal. La Marina – in the port, via Banchina 24 — I bought a beautiful linen shirt for Jim by P. Langella in this shop selling Italian fashion for men and women.